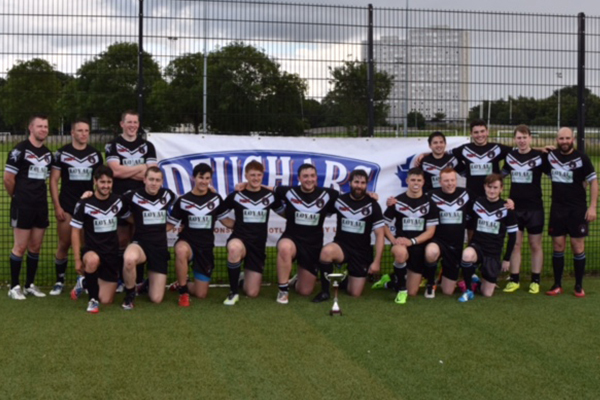 On a wet and windy summer’s day in Edinburgh, Strathmore Silverbacks triumphed 32 – 30 in the Caledonian Brewing Company National League Final, thereby also securing a place in the 2018 Challenge Cup. The game was played on the 3G pitch at Edinburgh University’s Peffermill Playing Fields. This was a good decision given the amount of rain that fell during the game. 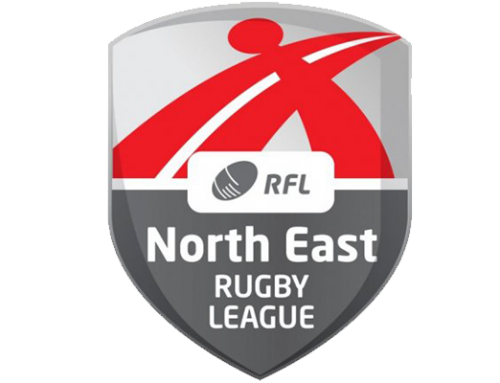 The game was played throughout in good spirit with some good end to end rugby league. The Silverbacks took an early lead with a well worked try by James Kirby which was converted by Lee Alexander. 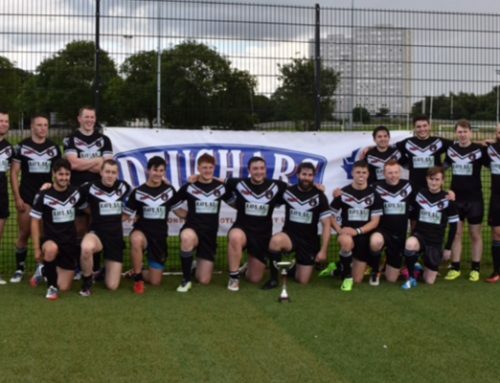 The Eagles then put together some good structured rugby league which led to 2 tries for winger Patrick Noutch on 7 and 14 minutes, the first with him finishing off some good handling and the other with a great scoot from dummy half. Timmy Kennedy failed to convert both tries leaving Edinburgh 8 – 6 ahead. The game ebbed and flowed with both teams having opportunities in the opposition 20 but strong defense prevailed. The deadlock was broken on 26 minutes with a sweeping move by the Eagles with Callum Kennedy finishing off some good handling with a great side step of The Silverbacks full back to run in a great try from 40 metres. Timmy Kennedy converted from in front of the posts to take the score to Strathmore 6 Edinburgh 14. Strathmore then stepped up the pressure with quick play the balls resulting in 2 penalties and Stuart Gray plucked the ball off his feet to plunge over to score a very good try on 32 minutes. James Kiely then scored his second try under the posts on 36 minutes. 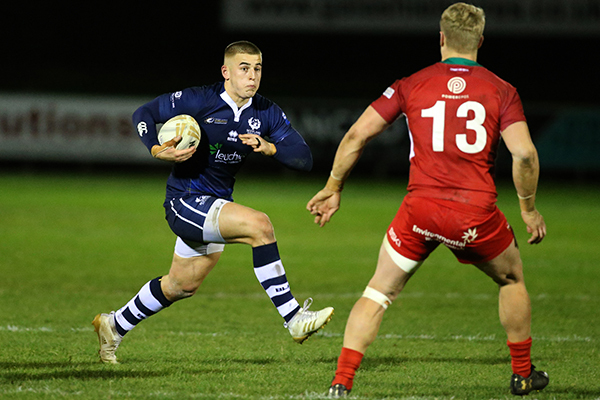 Lee Alexander converted both tries to give The Silverbacks an 18 – 14 half time lead. The second half saw more of the same, with the game flowing from end to end. As the conditions worsened, it was inevitable that mistakes would creep in and after an Eagles knock on, Dave Smith took the chance to put The Silverbacks ahead 22 -14. 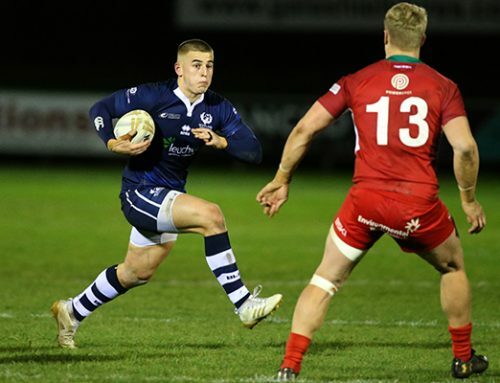 However, the Silverbacks were unable to stretch away and on 54 minutes, Callum Kennedy scored his second try for The Eagles to bring the score back to 22-18 but the Eagles let the Silverbacks kick off go dead and Lee Alexander finished off the consequent pressure. He missed the conversion of his own try to leave the score 26 – 18 to Strathmore. The highly competitive nature of the game was shown by the scoring in the last 20 minutes. 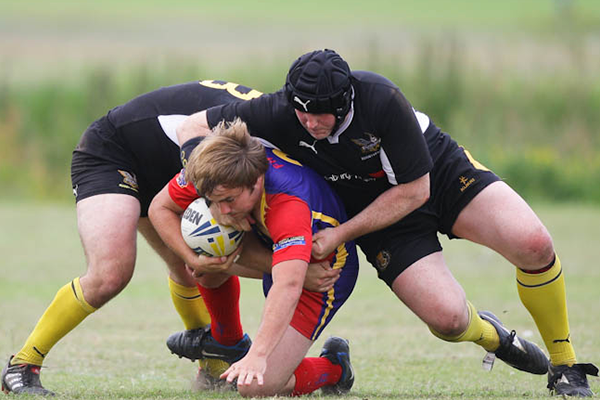 The Eagles were not prepared to give up the game and Tom Murray scored on 67 minutes with Callum Kennedy converting (26 – 24 to Strathmore), only for Scott Strachan to score after 70 minutes for Strathmore and with Lee Alexander converting this took The Silverbacks out to an 8 point lead. (32 -24). The excitement wasn’t over with Robert Stitt scoring under the posts on 78 minutes and with a successful conversion they were 2 points behind. In the remaining time, The Eagles were unable to move the ball away from their try line and Strathmore celebrated a thoroughly deserved win. 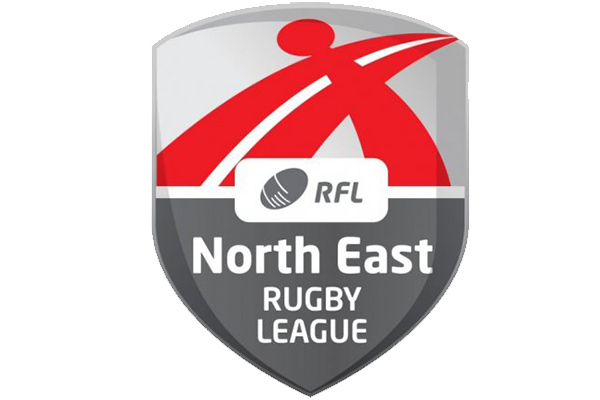 All credit to both teams for a great game of rugby league played in the right spirit and everyone present wishes Lee Alexander well in his recovery from what looked like a serious ankle injury in the last minute of the game.